That will do it if your board doesn't feature complex objects; otherwise, you will need to give a look at more complex drawing functions. Vector information for the basic HeroQuest board is stored inside HeroScribe/Icons/Vector/Europe/Board_EU.eps.gz and HeroScribe/Icons/Vector/USA/Board_US.eps.gz, in .eps files compressed in a .gzip archive (we suggest 7-Zip to manage such files); these .eps files include PostScript info that will be converted in .eps or .pdf by Ghostscript, within HeroScribe. Extract Board_EU.eps from the .gzip file, then open it with NotePad++, or TextEdit. While working on your board, you may want to see how it looks like after your edits: if that is your case, save Board_EU.eps inside Notepad++ / TextEdit then drag it into Board_EU.eps.gz, overwriting the original one; now open HeroScribe and export a blank quest as .pdf. Give it a look to see how your map is coming up. Before making any change to your Objects.xml, you first need to repack the European layout of your board. Rename Board_EU.eps (e.g. DewayneBoard_EU.eps, or anything else), then open Board_EU.eps.gz (with 7-Zip, remember?) and drag in there your new, hypothetical DewayneBoard_EU.eps; while still in 7-Zip, right click on the original Board_EU.eps and delete it. Now close 7-Zip and rename Board_EU.eps.gz to DewayneBoard_EU.eps.gz. You are half way on your vector board editing! Now open NotePad++: is there the Compare menu, under Plugins? If there is, jump to the next paragraph. If there is not, close Notepad++ and download the plugin (go with the UNI version), then copy the extracted ComparePlugin.dll inside C:\Program Files\Notepad++\plugins. Now, open HeroScribe/Icons/Vector/Europe/DewayneBoard_EU.eps with Notepad++, then go in HeroScribe/Icons/Vector/USA/, extract Board_US.eps from Board_US.eps.gz and open it too with Notepad++; you should have now both DewayneBoard_EU.eps and Board_US.eps opened in Notepad++. Click on Plugins -> Compare -> Compare and copy the edits done in DewayneBoard_EU.eps to paste them inside Board_US.eps (be sure to paste them in the same file region!). Once again: rename Board_US.eps to the hypotethical DewayneBoard_US.eps (or the one you chose, but it should be exactly like the European's), insert it into Board_US.eps.gz, delete Board_US.eps from inside Board_US.eps.gz and finally rename Board_US.eps.gz to DewayneBoard_US.eps.gz. Your vector board editing is done! Let's move on to your Objects.xml. If your board features corridors more complex than simple rectangles do not worry, we will look into other complex funtions later. Your Objects.xml editing is done! Let's move on to your board's raster editing. You now need to work at the raster version of your board, the one used in HeroScribe as the quest's background. Open HeroScribe and export a blank European quest as an .eps named eu.eps; then change the layout to North-American and export a blank American quest as an .eps named us.eps; you may now close HeroScribe. North-American version of your raster board is done! You may close Ghostscript. Now move the two raster files (eu.png and us.png) to their respective folders (HeroScribe/Icons/Raster/Europe/ and HeroScribe/Icons/Raster/USA/) and rename them after their Vector files (DewayneBoard_EU.png and DewayneBoard_US.png). That's it, even the raster version of your board is ready! Open HeroScribe and have fun. Or head to the more complex drawing functions to panic a bit. To draw such board you would need new functions like: colors, fills, paths, oblique lines, arcs and ellipses. 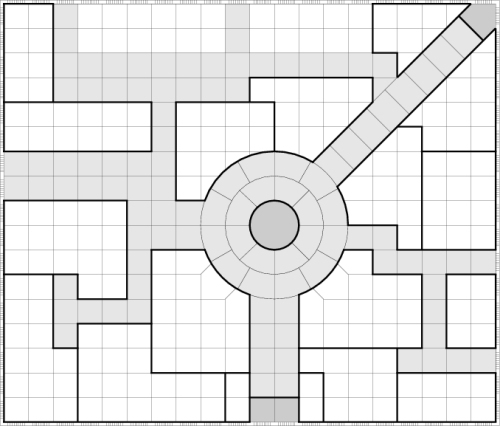 As long as we are talking about corridor and dark areas, or grids, you should be coding this at this point of the .eps; if you need to draw rooms, instead, just do them in the room section of the .eps. Then, you would need a function to fill the color with. This way you are filling the 2x5 rectangle starting at 10,1 with the previously configured DarkRGB color. You may choose which one from the strokes section in the .eps. Then, you would need a function to draw the stroke with. You are drawing an oblique line from 1,1 to 4,4; no filling this time, just a line. 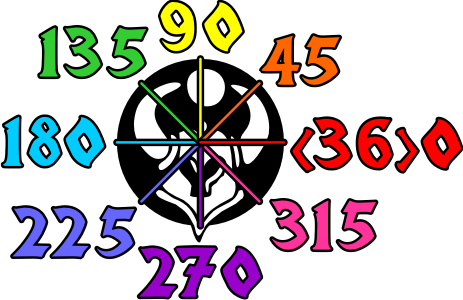 Please note that 0 means the start of the circle (3 o'clock), 360 the ending. You are now drawing a closed, partial arc; again, you could fill it by replacing stroke with fill. Room drawing: in order to draw room borders, be sure to pick the right stroke size (RoomStroke setlinewidth) then choose any of the known functions to start drawing. You are drawing a full 2 squares tall, 4 squares wide ellipse, its center being in 11,8. 0 being the anticlockwise begin of the stroke (3 o'clock) and 360 being the anticlockwise end of the stroke (3 again). You are writing "Text On My Board" at 9.5,9.5. That's it, you are ready to draw your own HeroScribe board! You may want to give a look on the boards available in the Just Boards Icon Pack from the Icon Packs Section; just extract the Vector board files (HeroScribe/Icons/Vector/Europe/xBoard_EU.eps.gz and HeroScribe/Icons/Vector/USA/xBoard_US.eps.gz) with 7-Zip, then open them with NotePad++, or TextEdit.